"The location is great, very central and close to everything." 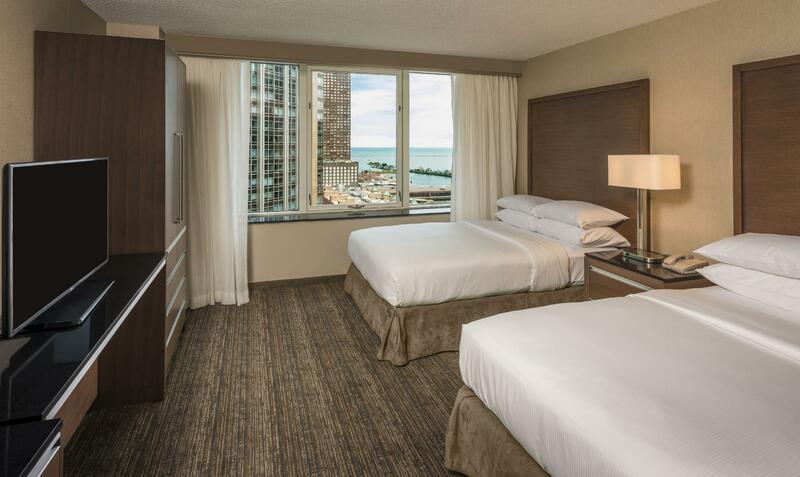 Have a question for Embassy Suites Chicago Downtown Magnificent Mile? 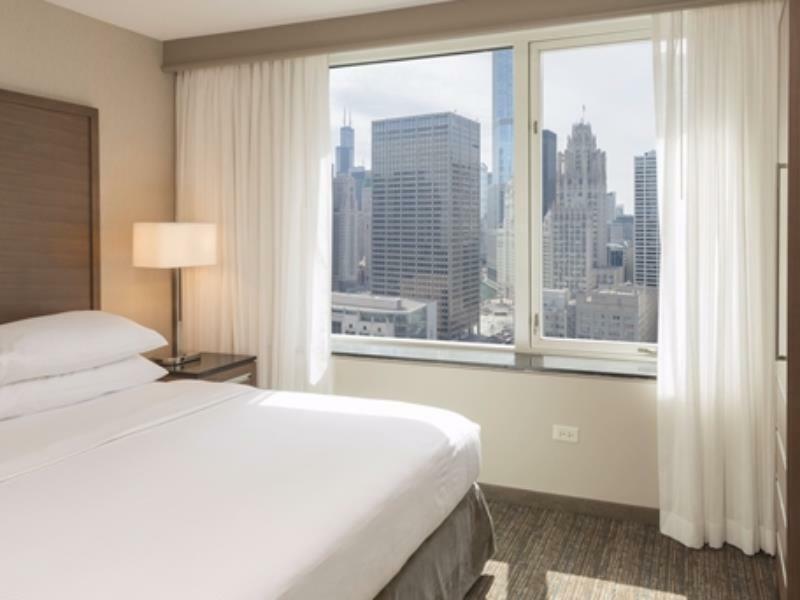 If what you're looking for is a conveniently located hotel in downtown Chicago, look no further than Embassy Suites Chicago Downtown Magnificent Mile. 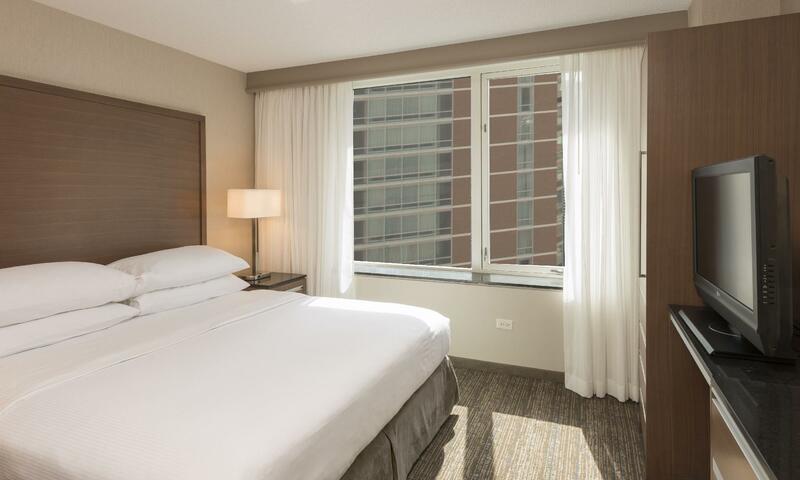 This upscale AAA Four Diamond property is just a walking distance to Michigan Ave Shopping, Navy Pier and more. The property recently unveiled their “Urbs in Horto” mural, which means city in a garden in Latin. The 176 feet long mural features nine unique scenes of Chicago neighborhoods mixed with local nature, to create the ultimate vibrant piece. 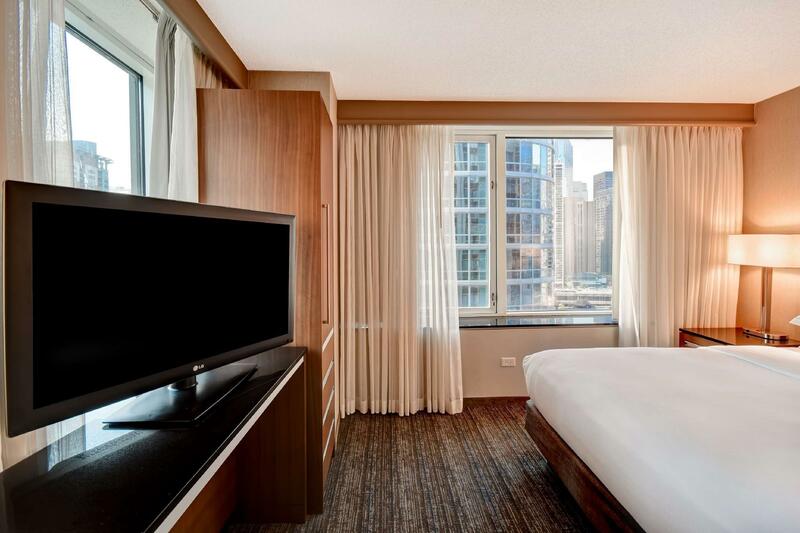 After an exciting day of discovering Chicago, unwind in the indoor pool, relax in the sauna, and rejuvenate in the newly renovated fitness center. The complimentary business center is open 24 hours a day. The property recently transformed the atrium into the eco-friendly Sky Garden, planted with fresh herbs like mint and sage to encourage interactions with the space and enjoy a 'direct-to-fork' approach. The Sky Garden is a great location for the property’s free made-to-order breakfast or getting a drink and some snacks at the complimentary evening reception while the 511 North restaurant offers some great menu items, including salads and sandwiches. 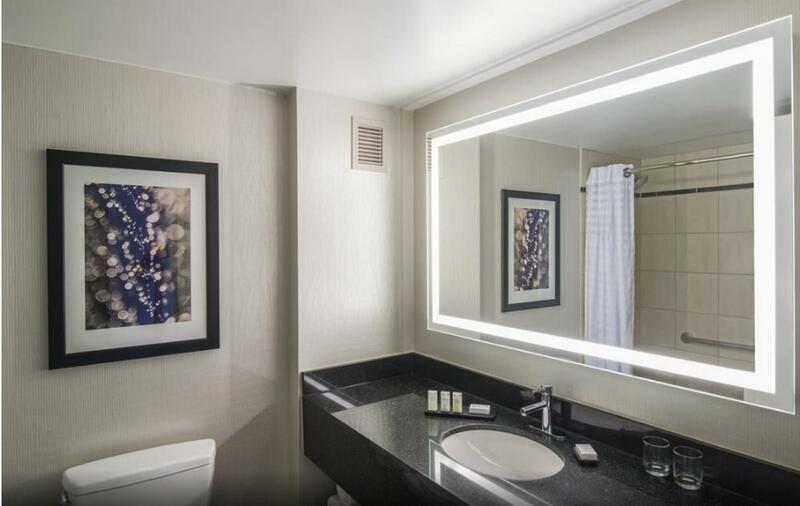 Enjoy the suite life at Embassy Suites Chicago Downtown Magnificent Mile. This non-smoking property features 455 spacious two-room suites with a private bedroom and separate living area that includes two 48-inch TVs and a kitchenette with refrigerator, microwave and coffeemaker. 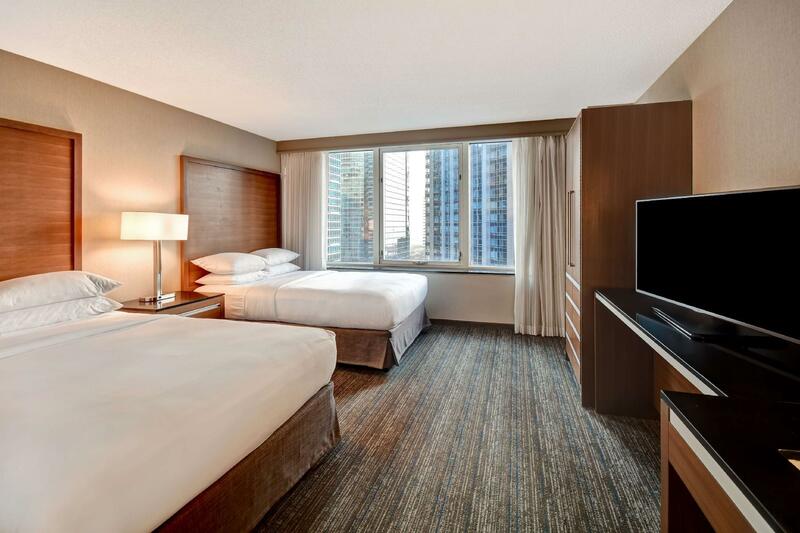 Wi-Fi and premium upgrades with extra amenities can be accessed with a fee. 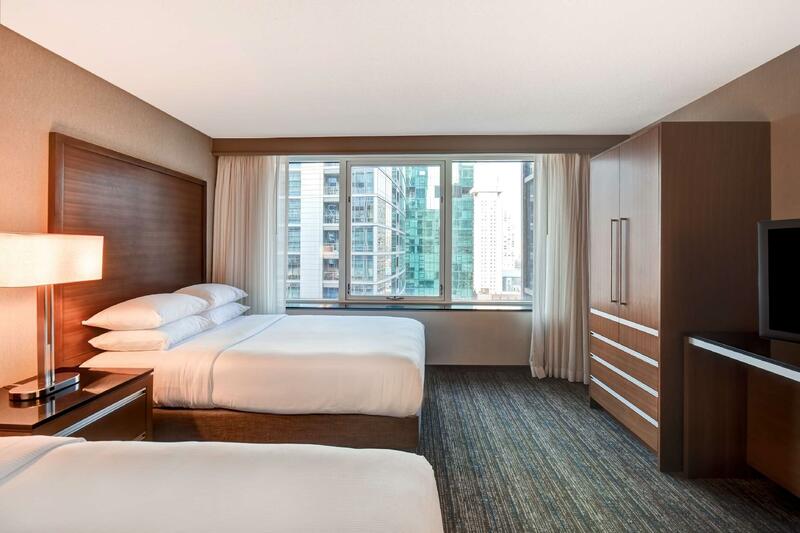 Embassy Suites Chicago Downtown Magnificent Mile is an ideal place of stay for travelers seeking charm, comfort and convenience in Chicago. When people leave room service trays outside the door, they don't get picked up for at least 12 hours. The elevator is so fast, it hurts your stomache. The best thing is the breakfast buffet, which is pretty good, but the lack of ceramic coffee mugs is cheap. The heater also broke down, but it was fixed pretty quickly. The thermostat was hard to use and required constant adjustment -- the digital display left me wondering what it's doing, and it always wanted the fan to be on full blast. The stupidest thing about this hotel is that they charge $10 a day to use wifi. I've never heard of such ruthless price gouging. Great location, staffs are wonderful. Room need new decor, bit old. Wholefood Market is just opposite the hotel and it close at 11pm. 10 min walk to Nevy Pier and downtown. Breakfast hours are too short and over crowded. Agoda and Embassy... get your act together. I CLEARLY booked a 2-bedroom suite from Agoda but upon arrival, it was a one-bedroom with no option other than a couch, one pillow and blanket. The location is great, very central and close to everything. The rooms are nice and comfortable although they could use a little better cleaning as there were some hair in the bathroom and some stains on the carpet and bed sheets. Otherwise rest was all good. Hotel room was awesome. Friendly staff. Check in and check out was very quick. Th stay was good. I liked nearly everything. Certain things perhaps cannot be changed but I will mention these anyways. (a) We have to take two elevators to reach our room. (b) A bit too far from the beach. We did go to Navy Pear which is close. But Navy Pear is not our favorite place. We like to walk on the beach at the lake. (c) No view of the lake! Thoroughly enjoyed the breakfast everyday that came along with my stay in the hotel. Staff were very friendly, room was made up daily and facilities and location were perfect. Well worth the money i paid for. Thanks AGODA for changing the hotel in due time; my stay in Embassy Suite was too short, but it was so comfortable and nice. Especially thank the doorman letting me taking a taxi in such an early morning! Enjoyed our stay. Had absolutely nothing to complain about but they do charge for wifi. Breakfast was included and was excellent. They also do free drinks in the bar between 5 and 7 each evening. Location is central if you don't mind walking 10 mins . A very nice family stay. Easy to get anywhere in the city and the rooms were very big and comfortable. The availability of a washer and dryer was also great for a long stay. I am a Hilton fan and a Hilton honors member. Maybe we picked the wrong night as it was New Year's Eve. We could not participate/enjoy managers reception, as there were hundreds of folks everywhere, kids running around unsupervised. Extremely loud , security was called for loud music in the halls. Could not enjoy or participate in the complimentary breakfast, hundreds of folks over the food, it was terrible, will never stay there again in life. Fantastic! We had a great stay. I would definitely stay here again! 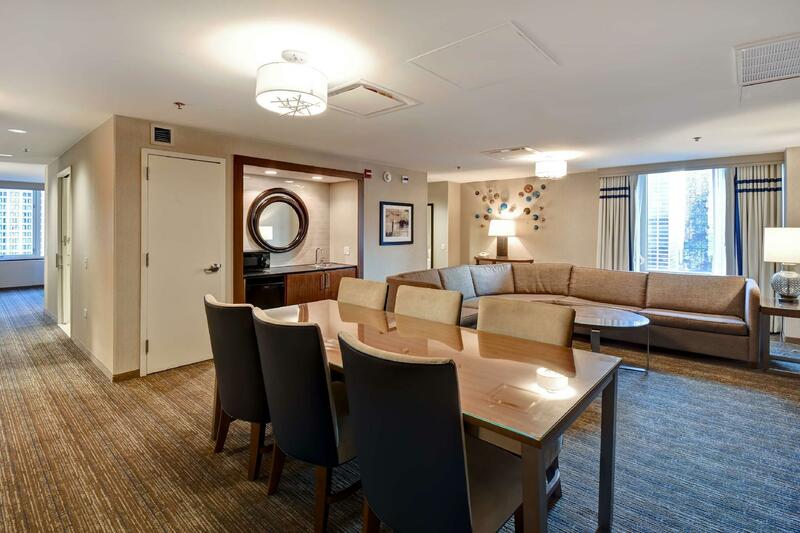 Great location to Navy Pier and Michigan Avenue! It was far better than we expected. We had grandchildren so the suite rooms were perfect. We could put the kids down for a nap and still use the living room to visit, watch tv and eat. Good location for sightseeing central chicago. Shame wifi is not free. Only stayed one night. Good sized room.